From Caersws NW on A470. Right 1/2m after railway bridge marked ‘Bwlchygarreg’. 1.5m to a telephone box. After 0.4m turn left through a gate marked ‘SHUT GATE, NO CARS’. There is a lock on the gate. For the code, please contact a committee member (see the committee page for email addresses). Through a second gate and park near left side of field. Do NOT drive beyond this point. Walk to T/O over 2 rocky ridges. There are three fields in which to land. All have trees surrounding them, some are quite large. You need to assess your approach carefully. There is no vehicle access to the landing fields. 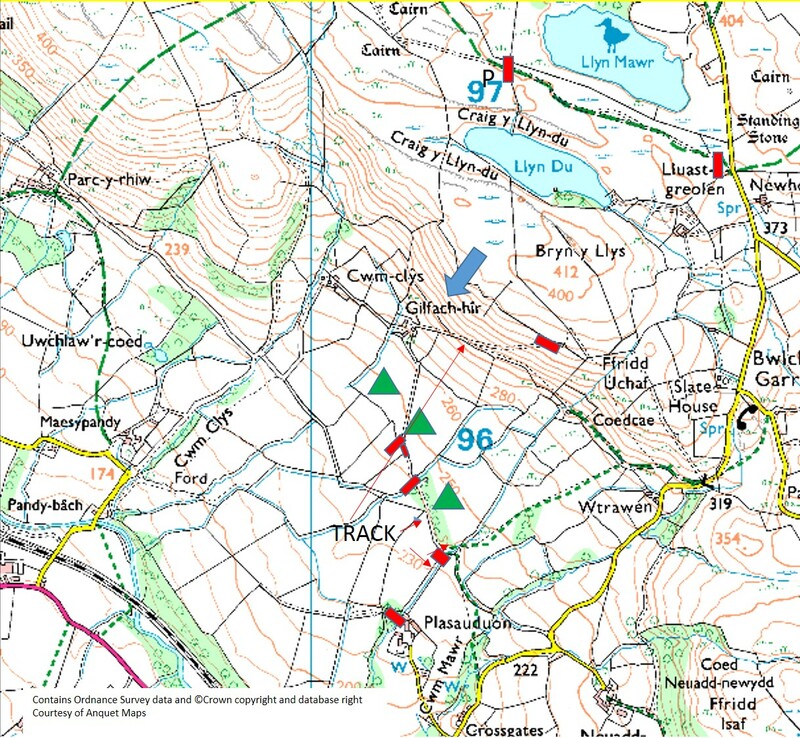 You can walk back up to take off via Gilfach-hir on the track marked; or walk down the track to Plasaudon where you can be collected. Note vehicles should park on the right by a brick barn. There is no permission to drive any further. Please note that trees have been planted in front of take-off. At the time of publication, these are not a hazard, but pilots must not land in the planted area. Take-off is over a fence and is straightforward with wind. On light wind days the fence can constitute a hazard. Top landing is tricky for hang gliders on a small, narrow ridge immediately behind take-off. Further back is very wet and subject to rotor. With enough height it is possible to land in the parking field near the cars. PG pilots must land behind the fence. There is no slope landing. Bottom landing is tight in a field surrounded by big trees. WARNING – turbulence can be bad when the wind is off to the right due to the hill upwind across the valley. Martin Knight, 05.08.09, 81km to Wrenbury. PG. Malcolm Beard, 2004, 124.5km to Ashbourne. HG. Nothing in the immediate vicinity. 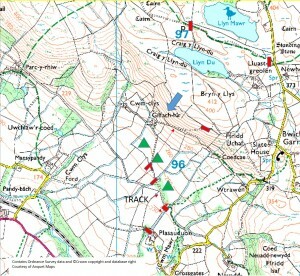 FL65 starts around Chirk. See weather page for weather station actuals and history as well as current camera shots of the conditions at launch.